Coach 353 was originally known as a ‘Jubilee’ coach, the design having been introduced in 1887, the year of Queen Victoria’s Silver Jubilee. 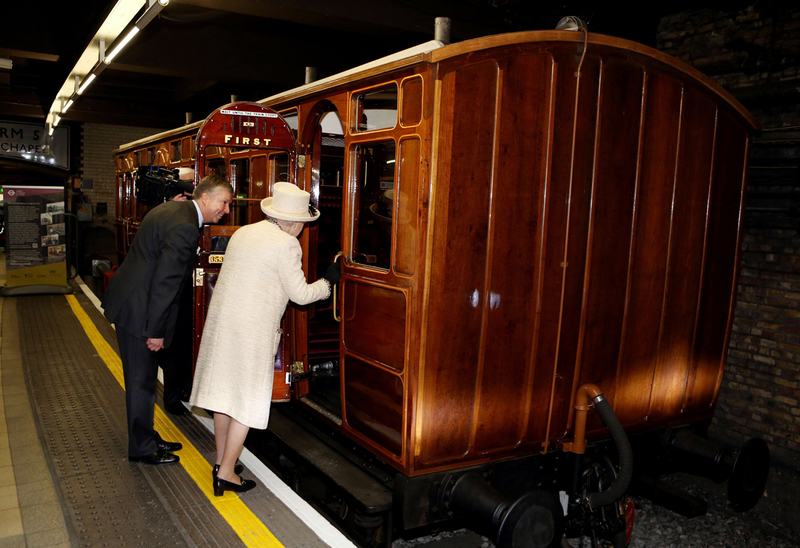 Having been such an important part of the Underground’s 150th anniversary celebrations, after a long and chequered career as carriage, workshop, club room, shop and home, coach 353 came full circle on 20 March 2013 when presented to HRH Queen Elizabeth II at Baker Street. The royal party, including the Duke of Edinburgh and the Duchess of Cambridge, made a formal visit to mark the 150th anniversary. They were presented to station and operational staff and to those of us responsible for the restoration and operation of 353, including the apprentice and workshop manager from the Ffestiniog Railway, the chair of our Friends, our chairman and sponsors Cubic and Siemens. Shunted into the bay platform 2 at Baker Street, 353 glowed under the lights in all its varnished teak glory, next a four car train of the latest ‘S’- stock with ‘Buckingham Palace’ shown on its destination board. Thus both the past and the future of the Underground were inspected by the royal party and a presentation of a framed ‘Trooping the Colour’ poster by Margaret Calkin James from 1932 made to Her Royal Highness. Our trustee, Howard Collins, then stole the media show by presenting a ‘Baby on Board’ lapel badge to the Duchess of Cambridge. 353 stayed in the bay for the rest of the day and attracted a great deal of interest before being moved back overnight to our Acton Depot.